PCB: The basic version that comes with all the features listed below. PCP: Has all the features of the PCB plus a Hi/Low setting option and additional silver trim. The Classic designs includes all of your favorite features; the Delayed Start function, Automatic Restart, large Digital Display, Remote Control, and a fan baffling system for increased efficiency and even greater noise reduction. Additionally, the PCP model comes with a HI/LO setting of 1500 or 750 watts. 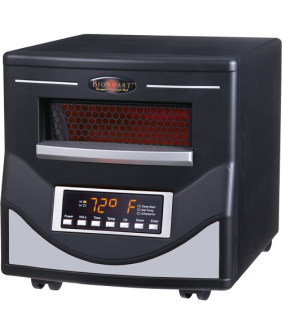 The BioSmart® Classic Edition Far Infrared heater features insulating ceramic liners in our proprietary heating chamber for added noise suppression and heat retention, an ultra quiet powerful fan, and larger, more efficient 120 volt quartz infrared heating elements enhanced to a 30,000 hour lifespan. This combination produces efficient infrared energy that can heat up to a 1,000 sq. ft. and provides more heat than any other portable infrared heater on the market. 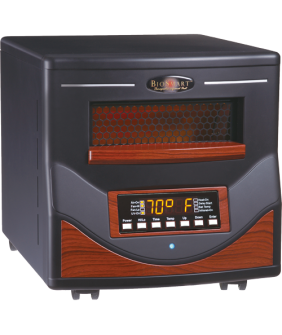 BioSmart®’s Classic Edition heater’s design incorporates serviceability features not found in other portable heaters. In the unlikely event that a component must be replaced, the BioSmart® heater is designed for complete component replacement in just a few minutes. Parts are always available through BioSmart Technologies. Simply plug the BioSmart® Classic Premium Edition Heater into any household grounded outlet and start saving! To Change the Temperature Reading Between Celsius and Fahrenheit: depress and hold the last 2 buttons on the heater (DOWN and ENTER) simultaneously for at least 3 seconds. Be sure to adjust the temperature accordingly. To synchronize your heater thermostat with your main house thermostat please email, service@biosmartsolutions.com for instructions or call customer service at 1-800-595-9605.